Is Cincinnati Going to the Dogs? Driving up Butler Warren Rd the other day the driver (my husband) pointed to a fenced-in area on the eastern edge of VOA Park and wanted details. He assumes that I know every nook and park in every city, township and village in the greater Cincinnati area. I knew there was a dog park in VOA Park but hadn’t actually sniffed out the details yet. 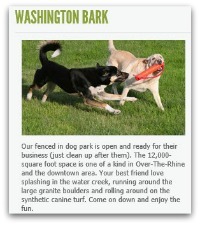 According the site what we saw was the dog park but there are enhancement plans in the works. Dog parks in greater Cincinnati have quite a following and lots of sites dedicated to locations, off leash parks and dog friendly events. Probably the latest addition to dog parks, “Washington Barks” is getting the most attention located in the rejuvenated Washington Park right in front of Music Hall in the heart of Over-the-Rhine.